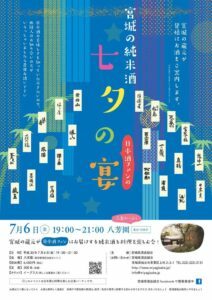 Miyagi Sake Brewers Association will hold Tanabata buffet party on Friday, July 6 at Happoen. They will offer you Japanese sake from 23 Miyagi breweries. Food is ticket exchange system. Sake and food are included in the ticket fee. As they are going to prepare a bamboo stalk for tanabata, you can write your wish on a tanzaku and hanging it on the stalk to celebrate tanabata. They will bring back to Miyagi your wish carefully and send to Sake brewery god “Matsuo Shrine” in Sendai, Miyagi. They will Heartfelt Prayer Fulfillment to make your wish come true in the shrine. 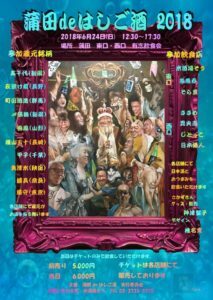 Ticket fee is ¥6,480 per person and maximum 200 attendees. Please enjoy Sake and Tanabata.